In the Neuro Probe AP48 chemotaxis chamber, chemoattractants added to the lower wells act on cells in a suspension added to the upper wells. A filter separates the upper and lower wells. After incubation the migrated adherent cells on the underside of the filter are stained and counted. 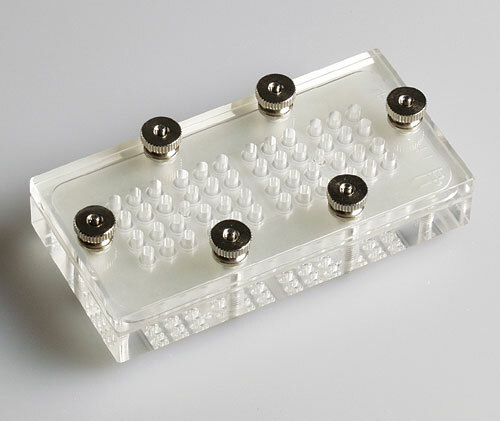 The AP48 consists of precision-machined acrylic top and bottom plates, assembly hardware, and a silicone gasket. The bottom plate has 48 wells, each with 25µL volume and a diameter of 3.2mm. 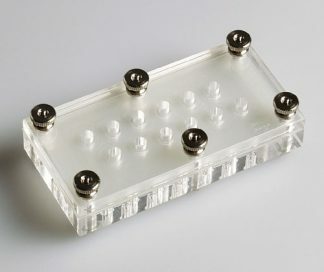 Corresponding holes in the top plate form the upper wells when the chamber is assembled. A single 25 x 80mm piece of filter membrane is placed between the top and bottom plates, and a gasket is positioned over the filter to create a seal. Narrow raised rims around mating surfaces of top and bottom wells enhance the seal. Before the migrated cells can be stained and counted, the nonmigrated cells must be wiped off the top side of the filter. An accessory pack (stock # P48AP)includes instruments for this purpose. 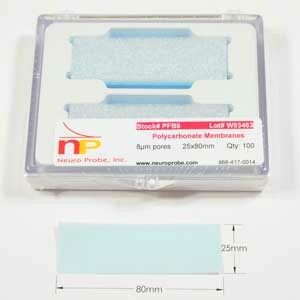 Accompanying each chamber is an AP48 protocol for its use and care. Please contact us to order replacement hardware, or if you have any questions.